The cameras and reporters may have moved on to other stories, but the people of Haiti affected by the 2010 earthquake have not been forgotten. A report from the What If? Foundation details the support that BGR’s grant has provided for the children of the Ti Plas Kazo neighborhood in Port-au-Prince: 17,000 meals over the course of six months, or over 2,800 meals per month, cooked by volunteers in a calm, safe environment that children enjoy. The food program, known as Lamanjay in Haitian Creole, has not been without its challenges. In the first part of 2012, the program’s vehicle was inoperative. Luckily, the food program team found a man with a “tap tap” (a brightly painted independent taxi) who helped them transport the food. Another challenge has arrived along with the Haitian rainy season, which forces the cooking team to operate in a leaky temporary structure with a tarp-covered tin roof. The What If? Foundation hopes 2012 will see the construction of a new permanent kitchen and cafeteria. Despite these challenges, the success of the program is evident in the calm order of the daily routine. Children arrive an hour before food is served to clean tables and sweep the floor with child-sized brooms. They then wait patiently for their food. When they are finished they give up their seats to other children and take their plates to be washed. Although these children face poverty and hardships every day, Lamanjay allows them a couple of hours of safety and peace and a place where they can fill their bellies, forget their worries, and be children, if only for a little while. Bildad Brevil is 8 years old. 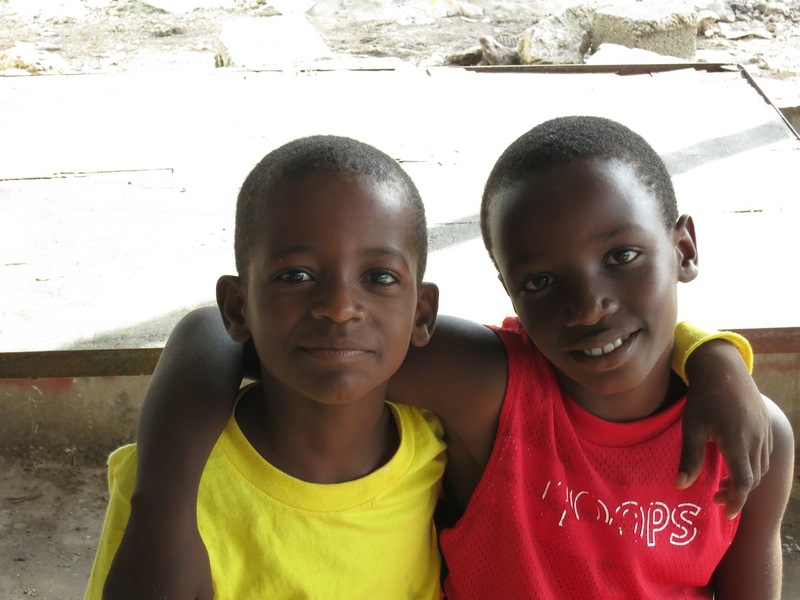 He is seen here in the yellow shirt (the boy in the red shirt is his friend Bradley) He currently comes to the food program for a meal every weekday; it is his only meal of the day. Bildad used to live in a house with his parents and two brothers, and used to go to school. But everything changed after his father died in the January 2010 earthquake. His mother, left without a home and no source of income, camps out with her sons on some land near the food program site. She says the food program is the only reason Bildad continues to be healthy, but she regrets that she cannot afford to pay for a place to live or to send Bildad to school. 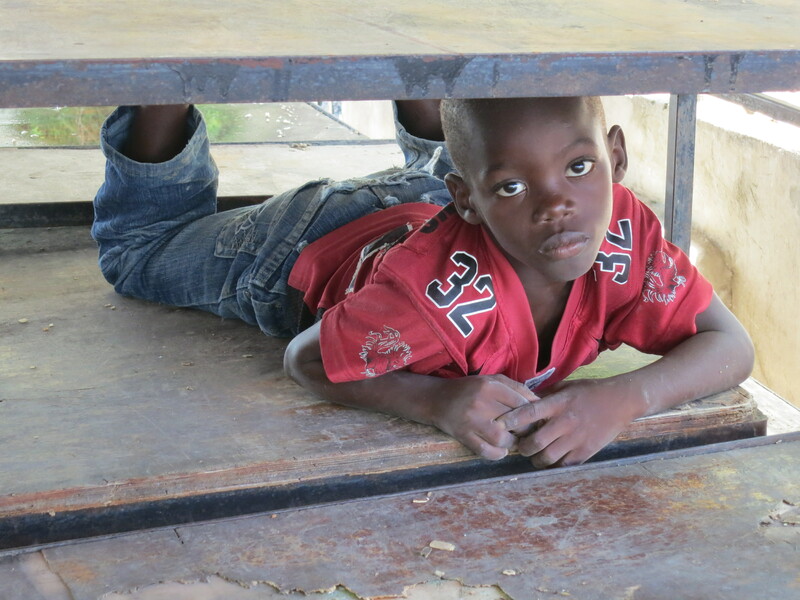 Wisler Joassaint is a very shy 6 year old. Here, he waits under one of the food program tables for the food distribution to start. Since both his parents just got jobs at a factory in another part of the city, he comes to the food program to get his one meal of the day, as his mother is not home to cook for him. 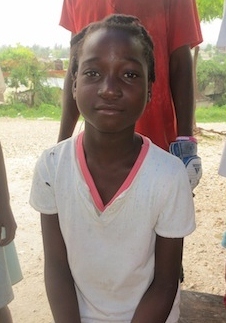 Jean Sophonie is a 9 year old girl who lives with her mother in a tent community near the food program. She comes to eat at the program each weekday afternoon. She says she likes the food there and feels safe at the food program site, whereas she does not feel safe in the tent community. She wants to be a nurse when she grows up. For now, however, her mother cannot afford to send her to school, as is the case with many children in the program. She prays that one day they will all get to go to school, so they don’t have to live in tents when they grow up. 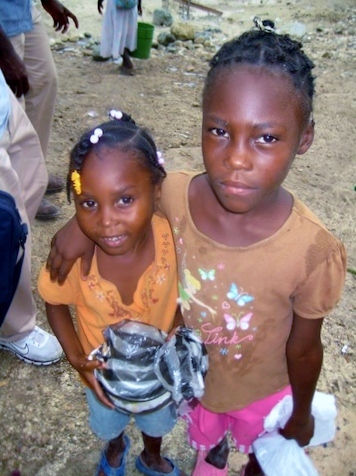 Katiana Pierre (at right) lives in a tent with her two brothers, her sister, and her mother. Her father died in the earthquake and her mother works selling things bythe roadside. They don’t have food at home, so she is glad she can come to the food program for meals. She does not know what she and her siblings would do without the food program. None of them go to school. They would like to go but her mother cannot afford to send them. They bring home part of the meals they get at the food program, so that they can eat it later. This entry was posted in Food security, Projects & programs, Uncategorized and tagged Children's hunger, Haiti, What If Foundation. Bookmark the permalink.